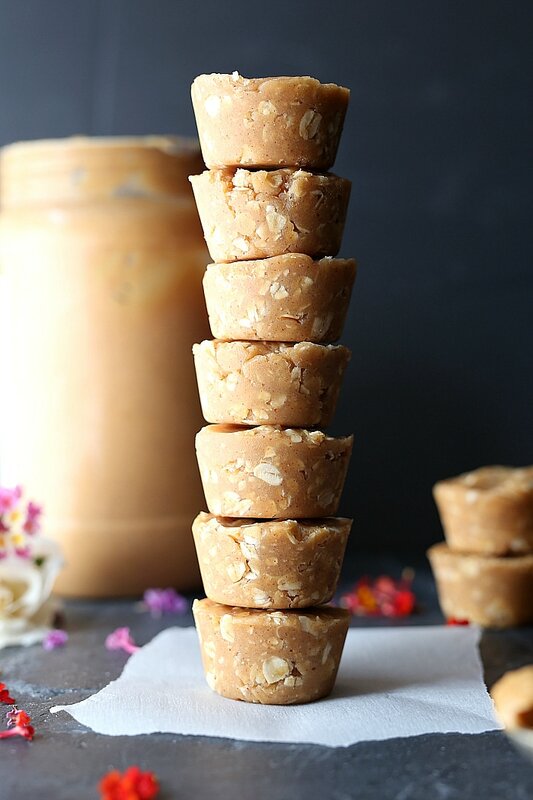 Peanut Butter Oatmeal Cups – Ridiculously good mini peanut butter oatmeal cups! 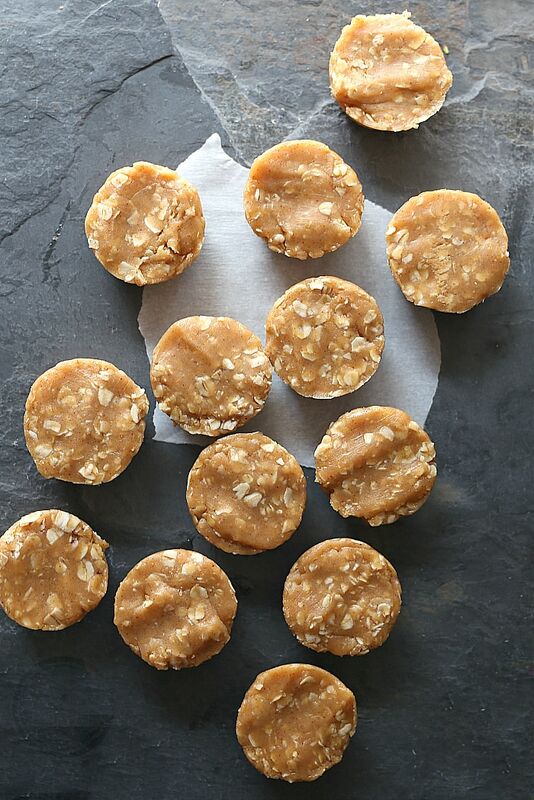 These are the best no-bake peanut butter and oat cups that taste like a cookie, are vegan, and gluten-free made with healthy ingredients! The BEST peanut butter oatmeal cups are right here! You have landed on one of our favorite no-bake treats that are healthy enough to enjoy as breakfast, dessert or an energizing snack. They take less than 30 minutes from start to finish, making them a favorite go-to whenever your sweet tooth needs a quick fix! 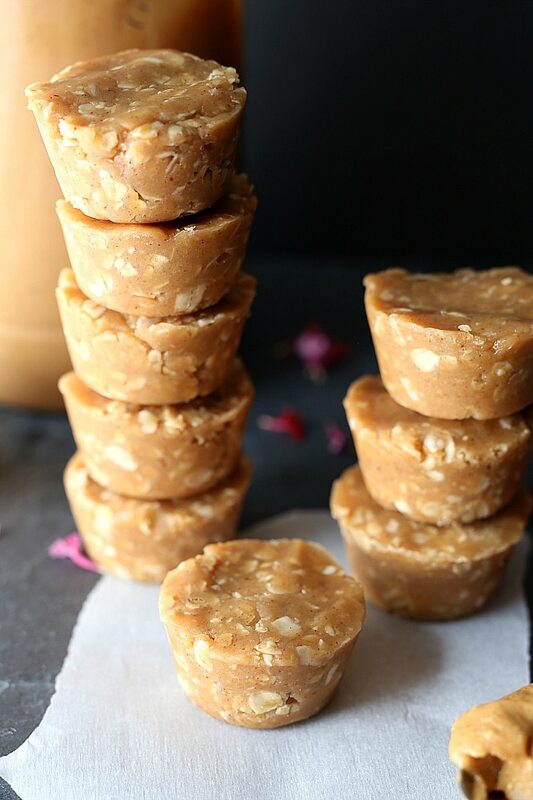 These No Bake Peanut Butter Oatmeal Cups are velvety, sweet, creamy, soft and satisfyingly scrumptious! 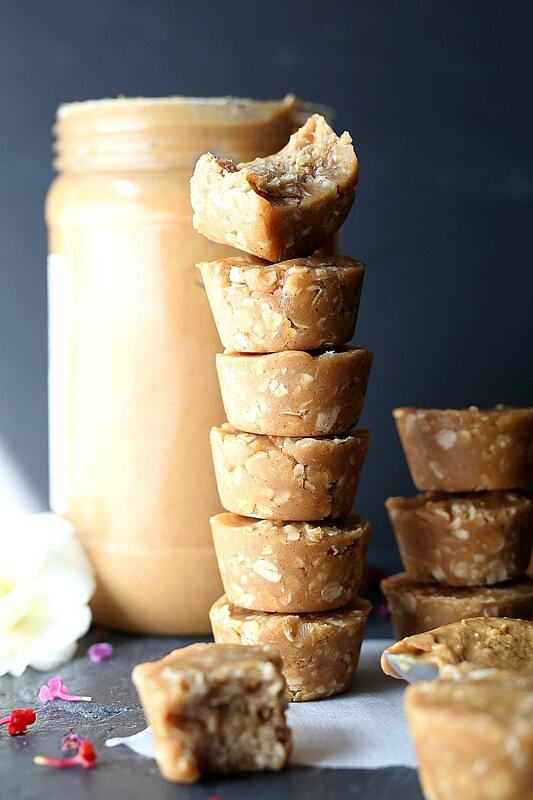 My oatmeal cups, bars and energy bites are all similar in ingredients and these ones are a slight replica of these epic Chocolate Peanut Butter Marshmallow Treats but without the chocolate and marshmallow. The other night as we finished up dinner my husband asked if we had any of the chocolate marshmallow treats. To his despair they were all gone, and I did not have any chocolate around, but I was able to whip up a batch of no bake cookies formed in a mini muffin pan within minutes! After all, what could be better than creamy oats soaked up in rich melted peanut butter and sweet maple syrup? These are SOOOO good! Peanut butter and oatmeal together are two of my favorite foods in the morning. 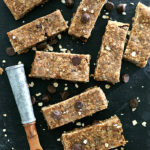 I love it served in a peanut butter and jelly oatmeal bake, breakfast bars or just large bowl of creamy oatmeal with banana and a drizzle of peanut butter on top. They are a beautiful match made in heaven and have tons of health benefits! Peanut Butter is high in fat and calories but packed with tons of nutrition. It contains magnesium, potassium, protein, antioxidant vitamin E and immunity-boosting vitamin B6. Peanuts, although called a “Nut” and look like a nut are actually a legume. When shopping peanut butter brands, it is best to always look for natural organic peanut butter as most brands add unnecessary sugar, fat and hydrogenated oil to their products. I love using Costco’s Organic peanut butter for about $10 for 2 large containers. It is nice and thick if you drizzle the oil on the top off first before mixing it. Oats are rich in vitamins, minerals, fiber, antioxidants and helping with weight loss, regulating blood sugar levels and cardiovascular health. They are one of the best ancient whole-grain foods to consume! Oats can be found most commonly in stores as steel-cut, rolled oats, and instant oats (quick cook oats). Instant oats are the most processed form and it takes less time to cook presenting a mushier texture. I like them best for this recipe as they blends well, absorbing quicker with the peanut butter, coconut oil and maple syrup creating a smooth texture. You can also check out here about how healthy oats are for you. Use a mini silicone muffin pan to easily pop out the cups. 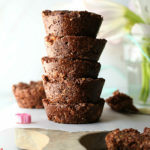 If you do not have one, mini cupcake liners can be used so you can easily remove the oatmeal cups from the muffin tin. 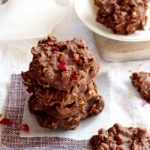 Use instant oats if you can as it creates a more blended creamier texture. Melt the coconut oil, maple syrup and peanut butter for about 30 seconds in the microwave or until the coconut oil is melted. Whisk them all together until they are well combined then add the quick cook oats, potato starch, vanilla, cinnamon and salt. To quickly have them ready pop them in the freezer for about 15 minutes before serving. 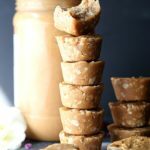 I like to say “a bowl of oatmeal a day helps keep the doctor away!” And when you do not have time to wait for a bowl of oatmeal to heat, simply grab one of these delicious peanut butter oatmeal cups! If you make this recipe I would love to see it! Find me on social media @delightfulmomfood and hashtag #delightfulmomfood so I can see and share what you are making! Follow me on Facebook, Twitter, Instagram and Pinterest. 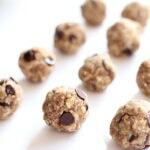 Peanut Butter Oatmeal Cups - Ridiculously good mini peanut butter oatmeal cups! 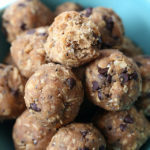 These are the best no-bake peanut butter and oat cups that taste like a cookie, are vegan, and gluten-free made with healthy ingredients! Prepare a 24-cup mini muffin pan. Use a silicone muffin pan for easiest use to pop out the oatmeal cups. If using a silicone muffin pan, spray it with cooking spray. If using a mini metal muffin tin, line it with mini muffin liners and spray it with oil. In a microwaveable bowl add the peanut butter, maple syrup and coconut oil. Heat for about 30 seconds or until the coconut oil is melted. Whisk together until smooth and creamy. Add the oats, potato starch, vanilla, cinnamon and salt to the peanut butter mixture. Mix to combine. Using a spatula or spoon scoop and press down into muffin cups, filling the cups to the top and press down with your hands to flatten the tops. Place in the freezer to harden for about 15 minutes. Then transfer to an airtight container and store in the refrigerator.